The SD flat panel antenna being developed in partnership with Qest. Satcom Direct’s (SD) hardware manufacturing division SD Avionics has partnered with Germany-based QEST to develop a flat panel satcom antenna that can fit on light and midsize business jets. 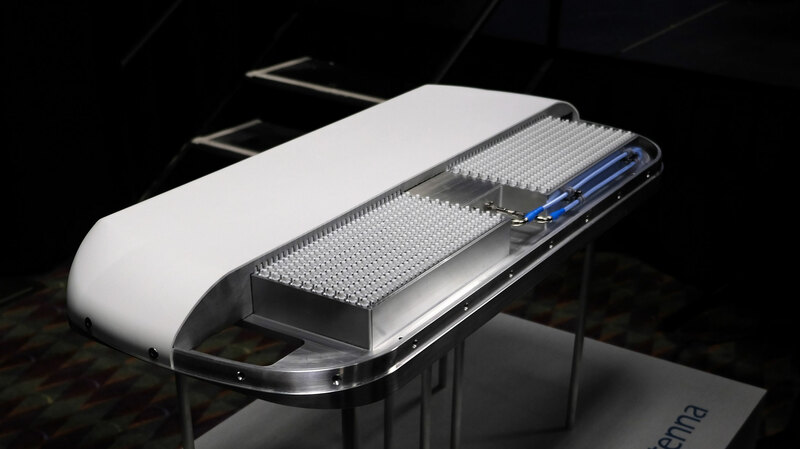 The electronically steered phased-array antenna would bring high-speed connectivity to a wider range of aircraft. SD is working with OEMs on specifications and development, with product launch targeted for 2020. A conceptual light-jet prototype is on display at SD’s booth (250) and its static display (SD40). Compatible satellite network constellations will be announced next year, said SD, which will be the exclusive provider of the antenna to business aviation, military, and government customers worldwide. It will be designed to be “future proof” and compatible with low-earth-orbit and geosynchronous satellite networks operating in multiple frequency bands to the portfolio. Designed for aircraft too small for a tail-mounted antenna, the flat-panel design is scalable and modular, conforming to the size and shape of each aircraft’s fuselage “without bringing excessive weight or power requirements,” according to SD. Once available, the antenna will become part of SD Xperience, the company's new aircraft connectivity consulting service. “Our investment means more passengers, crew, and flight departments will access reliable, secure connectivity to support their day-to-day operations,” said SD founder and CEO Jim Jensen.